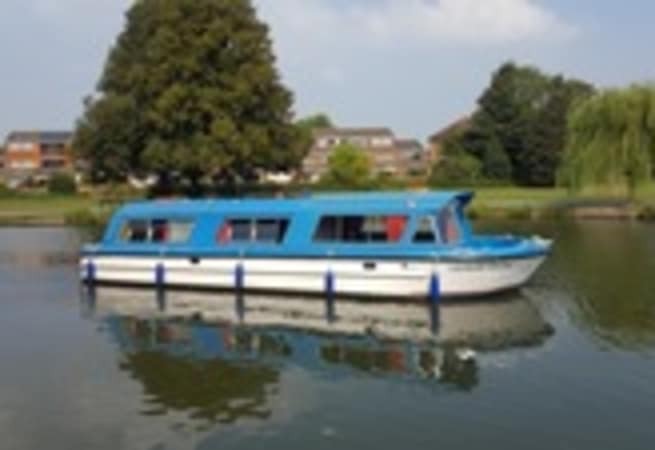 The Caversham Montego is the perfect day boat for any family looking to explore the Thames. She is very easy to handle with many comforts in the saloon and galley. She can be moored very easily for stop-offs whether its lunch or just a drink. She is available for bareboat charter, prices start from £330.00 per day. She has a large sliding roof over saloon for open-air cruising. Single floor level throughout with wide safe decks. Galley with oven and fridge. Fresh water flush toilet with wash hand basin (+ shower for overnight stay). Sufficient crockery and cutlery for 12 people including glasses, pots, pans and kettle. Fully equipped with the necessary skipper's inventory including life ring, mooring irons, boat hook and fire extinguishers.